The Buddy Holly Hall of Performing Arts and Sciences has broken ground in Lubbock, Texas, setting a milestone for the arts project in the hometown of the iconic 1950s pop legend Buddy Holly. The centre features the 2,200-seat Helen DeVitt Jones Theater; a 425-seat studio theatre; a grand hall; a bistro; and the 22,000-square-foot home to Ballet Lubbock with five dance studios. The Christine DeVitt Lobby will be a gathering point and community asset. 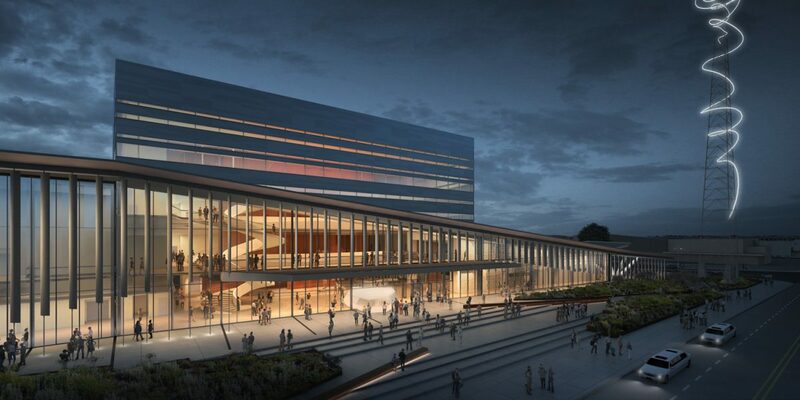 “The aim for Lubbock is to create a performing arts centre as good acoustically, as welcoming to the public, and as attractive to performers to be among the best halls in North America,” said Jack Diamond, Principal, with Toronto-based Diamond Schmitt Architects. 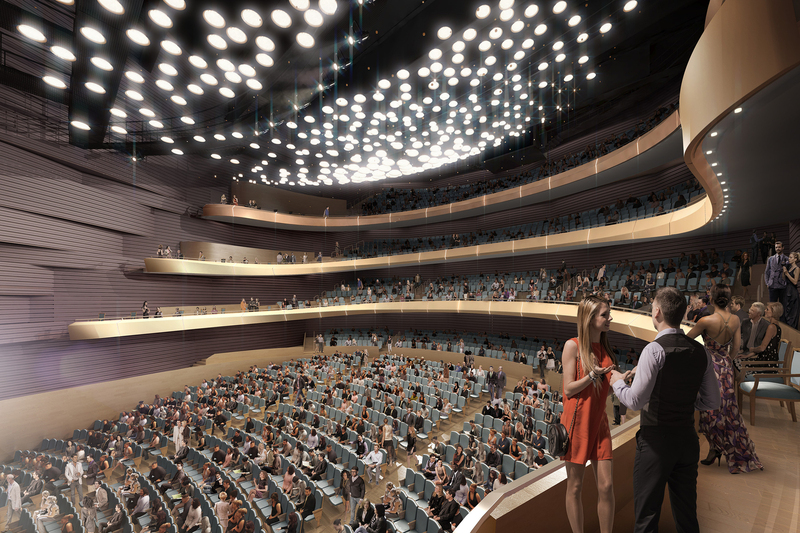 The multi-purpose nature of the venue will allow for a wide range of activity, from opera, Broadway shows and symphonic music, to rock concerts, conferences and social events. “To achieve this versatility, the floor of the auditorium can have raked seating or be flat for a standing audience, either below or in line with the stage,” said Matthew Lella, Principal, Diamond Schmitt. The central volume of the structure conceals the fly tower and is framed by a roofline of swooping planes with cascading columns that establish a strong visual identity and create a welcoming entrance. 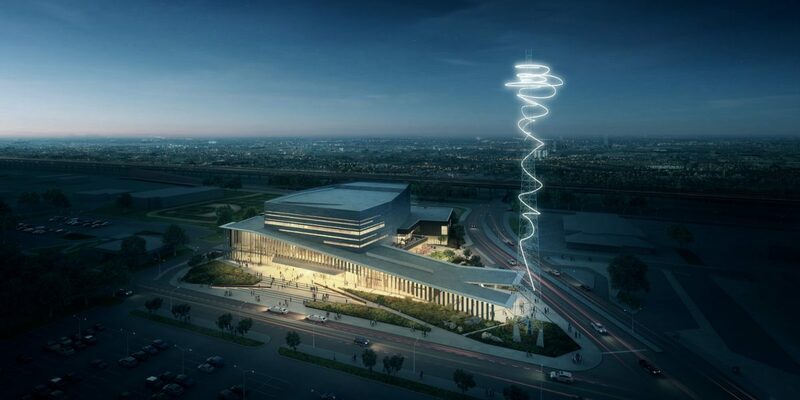 A replica of a 200-foot telecommunications tower will be installed on the site as a light sculpture, forming a beacon for the performing arts centre. Diamond Schmitt is working with development team partners Garﬁeld Public/Private, LLC, Parkhill, Smith, & Cooper, MWM Architects, Hugo Reed & Associates, Jaffe Holden Acoustics, Schuler Shook, and Lee Lewis Construction. The 218,000-square-foot performing arts campus is on track to open in 2020.